San Diego has it’s very own Lotus Club! 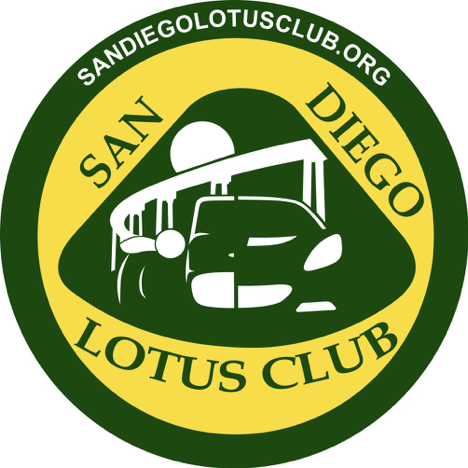 The San Diego Lotus Club is now live as the newest Chapter of the Golden Gate Lotus Club. SDLC is proud to join the Bay Area parent organization as well as the sister Chapters in Sacramento and Los Angeles (Lotus Club of Southern California). SDLC is dedicated to the enjoyment of, and enthusiasm for, one of the world’s great automotive Marques: Lotus. The club serves as a satellite chapter of the Golden Gate Lotus Club (GGLC) as a convenience to residents of San Diego and Imperial Counties as well as nearby residents of the greater Temecula Valley area of Riverside County. San Diego Lotus Club is open to all who have an appreciation for Lotus cars, Lotus’ rich history of motorsports competition and technical innovation. The San Diego Lotus Club exists to promote interest in Lotus cars by bringing together Lotus owners and interested people to engage in club events for the exclusive enjoyment of members that center around the usage of members cars. The new SDLC organizes weekend drives to enjoy the beautiful back roads of Southern California as well as any other activity that provides for the enjoyment of our cars and things automotive. Our “fun runs” are generally scheduled on Saturday or Sunday mornings and usually include a stop for breakfast or a snack along the way. Our inaugural event will be a San Diego County back country fun run/morning drive on Sunday 1 July. Check out the Events page on the SDLC website to sign up / get the details. Visit the SDLC website to to learn more. Click on the membership button to join in on the fun! We look forward to sharing our enthusiasm for the Lotus marque with you.